Abstract: If you are using R and you think you’re in hell, this is a map for you. A book about trouble spots, oddities, traps, glitches in R. Many of the same problems are in S+. Even if it doesn’t help you with your problem, it might amuse you (and hence distract you from your sorrow). 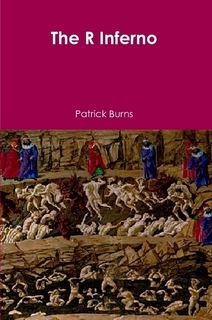 You can get a free pdf of The R Inferno. Tao Te Programming explores (in a language-neutral fashion) what good programming is about. Impatient R is an introduction to using R.